Global investors continue to back the US growth story and the dollar. 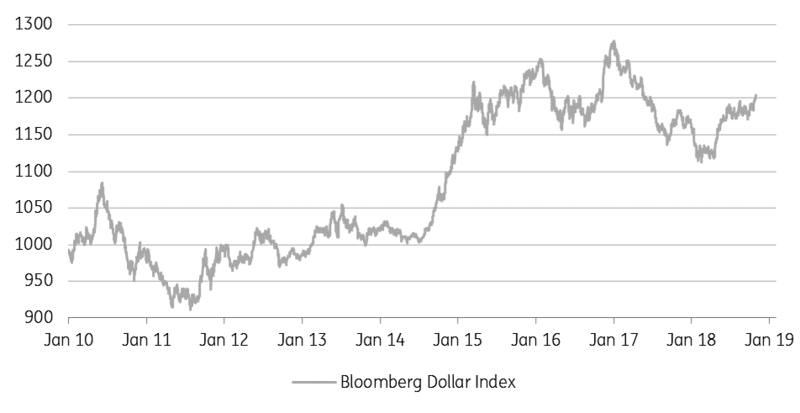 And several measures of the trade-weighted dollar are pushing to new highs for the year. There is not a strong case for altering that positioning right now, but the outcome of the US mid-term elections – and its implications for the US fiscal-monetary policy mix – will test the strength of those convictions. At the same time, a reassessment of the eurozone growth/monetary policy story has led us to downgrade our EUR/USD profile. The 2018 de-synchronised global growth story rolls on. US growth continues to outperform the Rest of the World and we suspect we are at the point in the US cycle where the Phillips curve reasserts itself and US wages break higher. Such a development would support Fed tightening expectations and, without further US fiscal stimulus, help characterise the US as a late-cycle economy. That’s not necessarily bad news for the US dollar. However, US mid-term elections will play a crucial role in USD pricing. The consensus expects the Democrats to win the House, raising expectations of: i) a fiscal impasse in Congress (be it no fresh stimulus and/or a battle over the debt ceiling) and ii) possible impeachment of President Trump. This looks like a modest dollar negative, but not a knockout blow since protectionism and pressure on European and Chinese growth will continue into 2019. Republicans retaining control of Congress would be the more surprising outcome. Additional fiscal stimulus, delaying the point at which the US converges on weaker global growth, would keep the dollar stronger for longer. Perhaps even into 2020. For the time being, we assume no new US fiscal package, US market interest rates topping in 1Q/2Q19 and the dollar trending lower into 2H19 as the US growth premium erodes. 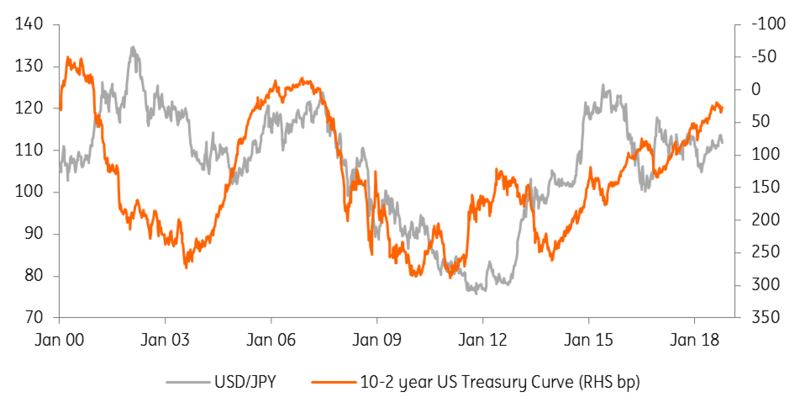 That story is probably best shown in our USD/JPY profile, which we see staying firm into 1Q19 before turning lower. The EUR, however, has more unique challenges. Our prior call for EUR/USD ending 2019 at 1.30 looks untenable at this stage. It was premised on a normalisation of ECB policy and the convergence in US and European economies, which would allow equity investors to rotate eastwards across the Atlantic. This month our eurozone team is taking a big chunk out of eurozone growth forecasts for 2019/20, plus delaying the first ECB rate hike into 4Q19. If EUR/USD is to move higher through 2019, it looks increasingly as if it will have to be driven by a weaker dollar rather than a stronger euro. We now see EUR/USD staying pressured near 1.15 into year-end 2018 and making a weaker recovery by late 2019. And a surprise Republican hold of the House and fresh US stimulus could see sub 1.10 forecasts make a surprise comeback.